Tracks of the Heart may be purchased from Amazon, Clan Destine Press, Kobo and iTunes. Robyn Koshol from Elder Park Book Reviews has given Tracks of the Heart a 5 star review on Goodreads. “Tracks of the Heart is three splendid outback stories packed into one small package. Although the book only runs to forty-four approximate pages- it sure does pack a punch. Lost love, abduction and facing the past are some of the themes of the stories and each one is emotionally charged. “Heather has a lot to offer in her writing – she has an easy and engaging writing style, brings her characters to life, her settings are beautifully rendered and, even though these are just shorts, there’s still enough of an emotional punch. Breakaway Creek may be purchased from the Publisher, Clan Destine Press. It is also available from Amazon, Kobo, Fishpond and Bookworld. 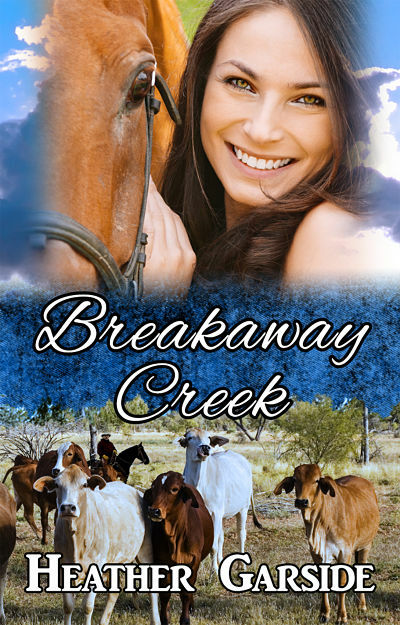 I’ve received a lovely review for Breakaway Creek from Robyn at Elder Park Book Reviews. Quote: ‘There is so much heart and soul to this history steeped story, from racial tensions of the past and present, heart-break, new love and finding out secrets from the past. Breakaway Creek leaves you wanting more- I know I didn’t want the book to end. To read the full review, visit Robyn’s site. ‘Immediately I am taken back to the sights, sounds and feelings of a boiling hot Queensland summer, living under a corrugated iron roof. I don’t usually read romance novels, but in this case, the author is from the district where I’ve lived most of my life in rural Queensland. It’s obvious that Ms Garside has lived her life in the bush as well; the book is authentically Australian and, I feel, historically correct. If you live in another country and would like to experience some of Australia without having to make the long trip Down Under, pick this one. I now have Colonial Daughter in paperback if you would like to buy directly from me. It will be available from online retailers in 6-8 weeks if you’re happy to wait. I also have A Hidden Legacy but will shortly re-package as Colonial Legacy. Should be available in May/June. Do you want to contact me directly at h.c.garside at BigPond. com? (No spaces). Colonial Daughter is now available from Fishpond, Amazon, Booktopia and Barnes & Noble in paperback.